As much as I love (and collect) older U.S. Coins, it seems all I’ve been picking up lately here – and sharing – is foreign stuff. Well, that changed last week I picked up four (that’s right, 4!) 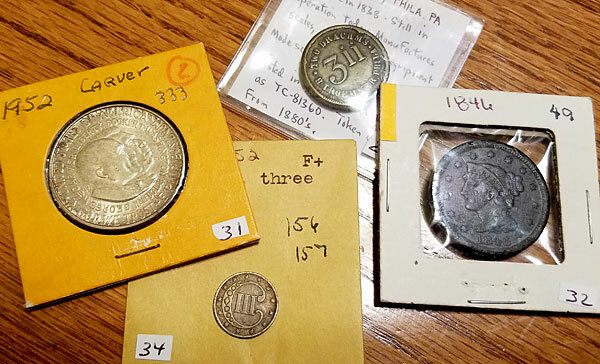 vintage American coins at a coin club auction! Here’s a little more about each coin, along with closer shots. 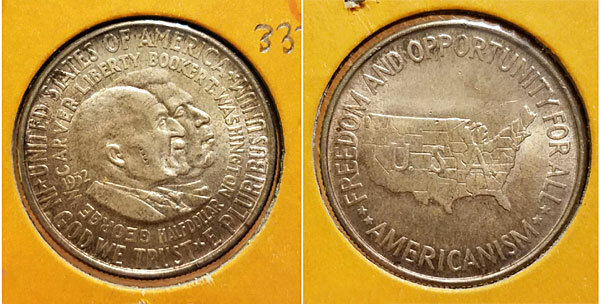 These were the last of the older commemorative half dollars that came out of the U.S. Mint, following 30 years until they started up again for more of the modern stuff. The front features two prominent African Americans, Booker T. Washington (lecturer, educator, and principal of Tuskagee Institute), and George Washington Carver (the agricultural chemist famous for improving the uses of peanuts! ), and on the back a design of the U.S.. With “Freedom and Opportunity For All” at the top and “Americanism” at the bottom. I’m always a sucker for these! My favorite coins to collect are the odd denominations they don’t make anymore, and these 3-cent pieces are just super cool and REALLY tiny (though not as tiny as my 1 and 1/2 Pence piece from Great Britain, circa 1836!). I picked this one up for $24.00, and it’s book value is probably around the $35 range. I’ll see if it beats the condition of my other 3-cent pieces I already have, and if not it’s going right into the trading binder for later. Though I don’t mind holding onto in the meantime… they’re so pretty! I used to own one of these, but somehow over the years I’ve traded it away. 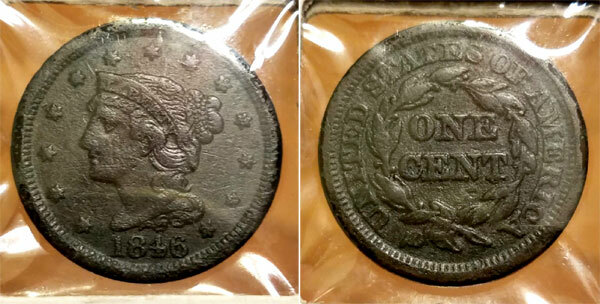 So when this Large Cent came up on the market in roughly the same condition as my old one (Fine) I took it home with me for $17.00. Red Book has it listed for around $30.00, so I was pleased with it. This one was MY FAVORITE of them all! It took me a while to catch on that it wasn’t *exactly* a token, even though it’s now classified one, but after some quick Googling I finally figured out what it was! A WEIGHT! Like, in which you measure stuff against! H. Troemner, Phila. PA. Founded in 1838 – Still in operation today. 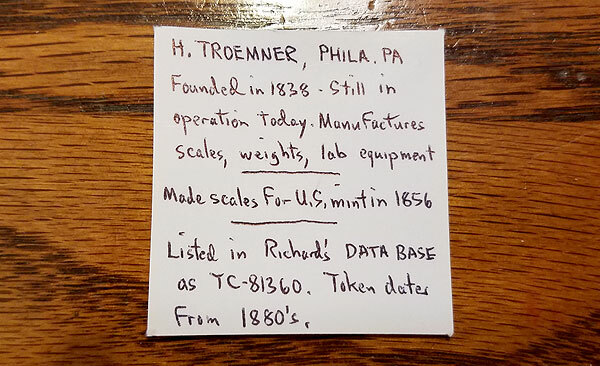 Manufactures scales, weights, lab equipment – Made scales for U.S. mint in 1856 – Listed in Richard’s DATABASE as TC-81360. Token dates from 1880’s. “In the days before electronic scales and prepackaged medicines, pharmacists used a balance beam scale to measure the appropriate amount of medicine to a customer. One would put the appropriate weights on one side and then pour the powdered drug on the other until the balance was centered. So fascinating, right??? And the “3ii” on it signifies 2 drachms, while the “Phila” is Philadelphia and the “H. Troemner” obviously being the name of the store. Tokens like these are also classified under “exonumia” (i.e. numismatic items other than coins and paper money). Hope your collecting is proving equally as interesting too! Feel free to share any recent pick-ups of your own in the comments below. What’s up, Doc? Who Wants a Royal Canadian Looney Tunes™ Coin? Great snags. If you decide to trade that 3 cent piece let me know. I would like to add one to my collection. The 2 Drachms piece is very interesting. happy to trade to ya! have anything interesting around equal value?